I love Italian food, especially if it good and not too pricy. These are my two favourites which i am sure you will enjoy too. At the Olive Garden the servers are some of the friendliest in Orlando, and in a place where the service is always very good, this is saying something. The food is exceptional and you will struggle to eat it all. All the entrees come with a free salad or soup and garlic breadsticks, which are so good one could just eat these all evening! They are the best garlic breadsticks I have ever tasted in Florida. The pasta dishes are excellent and very large and although they have their regular favourites, they often change the menu to add some variety. The main courses of meat or fish are too very good and far more than most people can eat. As usual boxes are provided to take home any excess food. If you don’t have time or are too tired to bother with stopping to eat, you can order a take out on your way home from the parks. The take out menu is almost as extensive as in the restaurant. The prices are very reasonable as well, which makes this an even better choice all round. I would recommend this restaurant for all ages, they cater really well for children, with a good childrens menu and colouring books and crayons to entertain them and because the service is so prompt, you don’t find the children getting bored. In this restaurant, if you are not very well acquainted with Italian food, the waiters are all very willing to advise on their most popular entrees and also what they have on their specials board. As I usually have steak or chicken at most of the Orlando restaurants, I decided to try the pork chops. I didn’t realise that I would get 2 8oz chops! , so it is lucky that they provide take out boxes as a matter of course. They came with garlic mash and mushroom gravy and they were delicious. They came with so many side orders that I didn’t know where to start. 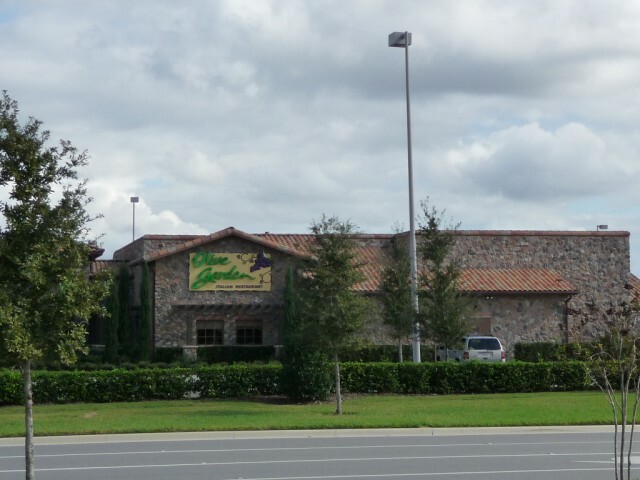 On my second visit to Carrabbas I had the Italian speciality of pork escalop milanaise. This is a pork steak served with pasta in a Neapolitan sauce, which is mainly tomato. Quite delicious. The desserts looked very appetising but I just didn’t have room for them, in fact I can’t remember the last time I actually had a dessert in an Orlando restaurant. Viewed 3321 times since 31 October 2010.